There is an established connection between manufacturing companies and the use of invoice finance to improve their cash flow. Looking at the UK finance figures for the asset-based finance industry, to the end of 2017, manufacturers make up 25.8% of their member’s clients. The key reasons why invoice finance works for manufacturers is that within a manufacturing business, there are significant costs which need to be met from cash flow. A manufacturer will be a business that takes raw materials and turns them into a finished product. This gives rise to a number of costs, some of which are not common to other kinds of businesses, such as service sector companies. These costs include purchases of raw materials, payment of staff and ongoing cost for premises and equipment. Raw materials may be purchased on a credit account basis, from suppliers, but business that is growing may require more materials than their cash flow will enable them to purchase. The other key facet of a manufacturing business is that they are often pressure to provide credit terms to their customers, irrespective of the product that is supplied. This wait to be paid, can result in cash flow pressures. The key benefit to any manufacturing business, of using factoring or invoice discounting, is that these facilities release the value of unpaid customer invoices immediately they arise. This means that the company does not need to wait until the debtors settle their accounts, in order to get access to that cash. When you are working with narrow gross profit margins, because of the need to purchase role materials and pay staff, getting access to that cash as early as possible can be a significant benefit. This is why there is such a high correlation between manufacturing businesses and the use of receivables finance services. With a factoring option, the manufacturer will also benefit from a credit control service, provided by the funder. This can have cost benefit advantages as you don't need in-house credit control staff (if you select the right provider). If a manufacturing company is exporting to overseas territories, this can also be funded and collected within a factoring arrangement. If the businesses dealing with customers where bad debts are a potential problem, there are bad debt protection options available, which to be added to all facilities. 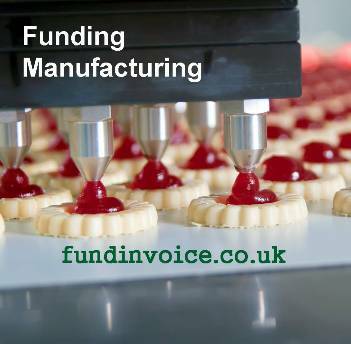 Please contact Sean on 03330 113622 for more information about invoice finance for manufacturers.